IT IS NO OVERSTATEMENT that, in contemporary jazz and wider circles, Swedish trio E.S.T. rose to become a powerfully seminal band during the ‘Noughties’. On the face of it, a piano trio – but that barely scratches the surface of why pianist Esbjörn Svensson, bassist Dan Berglund and drummer Magnus Öström were, in so many hearts, creatively untouchable. The dynamic breadth and profound atmospheres of E.S.T.’s music, across albums such as Strange Place for Snow, Seven Days of Falling and, later, the intense, improvised landscapes of Leucocyte and 301, pushed at limits whilst also respecting tradition; and their stunning live performances – thankfully preserved in a 1995 release, as well as extraordinary double album Live in Hamburg – left a feeling of excited astonishment as audiences filed out of packed concert halls. So when 2008’s catastrophic news of Svensson’s untimely, accidental death was announced, it was deeply felt that a guiding light had been extinguished. With the imminent release of each E.S.T. album, there was always a sense of expectation because (as also revealed in their hidden, closing tracks) it surely wouldn’t find them standing still. So Svensson’s vision, dating back to 2003, to enlarge the trio’s output for a series of international orchestral performances, should perhaps come as no surprise. But it’s a concept whose realisation, now, sets the pulse racing. The resulting E.S.T. SYMPHONY‘s ten tracks, across 78 minutes, are performed by the Royal Stockholm Philharmonic Orchestra, with Hans Ek as conductor and arranger. Integral to ‘that sound’ are the characteristic sonorities of Berglund and Öström, and their soloists couldn’t be more empathetic: Iiro Rantala (piano), Marius Neset (tenor sax), Verneri Pohjola (trumpet) and Johan Lindström (pedal steel guitar). Key to the project’s solid foundation is Esbjörn Svensson’s own, single orchestral arrangement of Dodge the Dodo, its shadowy, surging energy transformed into filmic grandeur: brassy riffs, dramatically sustained strings, ominously ascending steel guitar sirens… and Berglund and Öström in magnificent, frenzied overdrive. Hans Ek’s reinterpretations follow Svensson’s lead so congruously, the gentle lilt of Seven Days of Falling coloured differently by Neset’s tenor, Lindström’s sliding steel, and subtle string embellishments; but amidst the symphonic swell, it can only be E.S.T. as Iiro Rantala sensitively summons the musical presence of his late, fellow pianist. When God Created the Coffee Break (always a live highlight) has bassoon picking up the fugue-inspired piano momentum, the overall scale reminiscent of the many and varied orchestral transcriptions of J S Bach, with Rantala’s mid-point piano spotlight providing an immaculate echo of its originator’s genius. Eighthundred Streets By Feet send shivers up the spine, those swooning phrases beautifully embellished by the trumpet of Verneri Pohjola, supported by luscious orchestral waves which seemingly break shore; and the already existing tension in one of E.S.T.’s most majestically haunting tunes, Serenade for the Renegade, is raised to blockbuster soundtrack status, its sinewy, symphonic detail underpinning Lindström’s restless improvisations. Hans Ek also successfully refashions albums Tuesday Wonderland and Viaticum into expansive suites which send up shooting stars of familiar, much-loved melodies and grooves, proving (as if it were necessary) the depth and potential of this trio’s original creations; and the now-emotional, suspended solemnity of Viaticum, in particular, easily suggests symphonic Dvorak or Beethoven before hitting a Philip Glass-like pulse. Though these compositions pave the way for future performances worldwide, the presence of Berglund and Öström feels central to the continuity of the story, conveyed in the open jazz-piano spaciousness of From Gagarin’s Point of View and the lavish, propulsive splendour of Behind the Yashmak which closes almost reaching up to the heavens to triumphantly reunite with Svensson himself. The indelible impression of E.S.T., as a trio, can never be repeated, nor is that the intention with this impressive reimagining; for as well as prompting a rediscovery of their 13-album catalogue (try it – each one still something of a revelation), it re-evaluates the undoubtable integrity of the band’s considerable output on an orchestral scale, confirmed by Öström: “The music starts to live in itself… it’s not only E.S.T.… it’s going into the future, in a new setting.” And for that, we can be eternally grateful. Released on 28 October 2016, E.S.T. SYMPHONY is available from ACT Music, Amazon, iTunes and record stores. SUN BLOWING is an album which quite simply screams (or whispers) empathy, communication and extreme musicality. 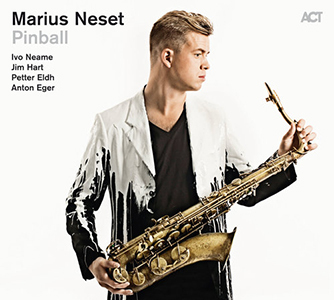 Recorded live in the studio within six hours, mostly as first takes and with minimal post-production intervention, this beautifully captured moment in time is the work of three masters of their craft – Marius Neset (tenor saxophone), Lars Danielsson (double bass) and Morten Lund (drums). Born out of a three-way conversation on a train and the subsequent offer of a free day in Copenhagen’s Millfactory Studios, despite having never played together as a trio, Lund explains his fundamental reasoning for this project: “The saxophone/bass/drums trio gives space and freedom. I felt that the three of us had the same passion for trusting the moment.” So, with an agreement to proceed “with as little preparation as possible” – and an invitation to ACT Music’s MD, Siggi Loch, to record the session – it now stands as a fascinating record of their encounter. Saxophonist Neset is, by instrumental nature, chief melodicist here – and his own albums over the past few years (including Birds, Lion and Pinball) have chronicled the extraordinary, upward trajectory of his relatively early career. But, importantly, this is an entirely democratic coming-together, typified by Lars Danielsson’s single-take opener Little Jump which, with its relentless, bluesy swing, apparently set the tone for all that was to follow. Title track Sun Blowing‘s simmering, Bachian overtones are gently carried on an echoic mist, and Morten Lund’s folksong-like Up North dances to his vigorous percussion as Neset and Danielsson overflow with babbling enthusiasm. Neset’s penchant for reflecting the vast, open landscapes of his Scandinavian homeland are evident in nine-minute Salme, his unmistakably broad, inflected tenor phrases eventually widening into cascading, descending-bass exuberance before a calm evocation of sundown; and perhaps the trio’s shared musical traditions are evidenced in blithe, airy promenade Folksong. At this stage, one has to remember that the evolution of these pieces is largely uncontrived, and certainly free-spirited, though Evening Song for B‘s serene, collected majesty never breathes a note of indecision; and Danielsson’s familiar, vocalised bass glides across the merest hint of electronic rebound, as it does in Don Grolnick’s The Cost of Living – another sea of tranquillity which, later, remarkably snaps into choppy, typically hard-pushed tenor from Neset over crackling bass and drum turbulence. 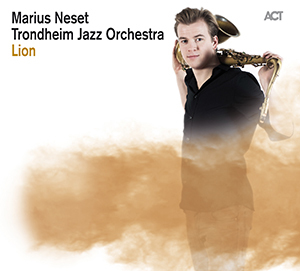 Marius Neset describes this recording’s intentional unpreparedness as being quite different to his usual approach – yet, referring to Danielsson’s sunny, azure-skied Blå, he simply states, “It felt like home.” Succinctly, that is the overriding, oxymoronic pleasure of this album – a natural balance of spontaneous, on-the-edge improvisation characterised by a delicate, secure sense of ‘home’. Released in the UK on 29 April 2016, Sun Blowing is available from ACT Music.